How To Position An Advertising Agency - Part II - Peter Levitan & Co. Welcome to Part II of How To Position An Advertising Agency. Here is Part I. Its a good place to start. I know, I’ve positioned and re-positioned my own agency and do this for my ad agency clients. Here’s what you are up against. Most advertising and digital agencies do essentially the same things for a living. Once you’ve decided on advertising or digital or integrated or mobile you are up against many other advertising, digital, integrated and mobile agencies. Most agencies fear not being able to offer all things to all clients. Clients have a very short attention span. They might not spend the time required to read your carefully crafted copy. In this case, being concise would help. An advertising agency’s brand positioning is just a starting point. It must be mission-driven, must permeate the agency’s messaging and must be internalized. There was never an insurmountable client objective; competitive barrier; brand strategy; creative execution that couldn’t rock a category or an agency meeting where we said, “no, we can’t do that.” “Nothing is impossible” was based on attitude. Saatchi’s killer attitude drove the agency and helped us want to be great. I’ll come back to attitude in a minute. Lets face it, for most agencies there are really only a handful of positioning options. I am being direct here. In many cases, how you express your positioning will be as important as what it is. Here are four primary positioning zones and best of examples of the positioning in action. The idea of creativity is at the core of most agency positions. When I talk to agencies and ask them to describe their agency positioning, most say that they are “creative.” After all, creativity is what most clients expect from their advertising agency and no matter what you eventually call yourself, you must always include being creative. It is the price of admission. It is, however, not very distinctive and hard to own. It is also, what most clients want. 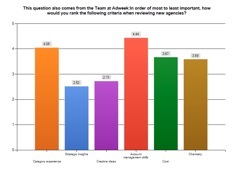 Here is a chart from The 2013 RSW/AgencySearch Agency-Marketer Business Report on what clients say they want from their agencies. Note: The lower the rating the higher the relative level of importance when evaluating Agencies. There is nothing inherently unappealing about a “Creative” positioning. In fact, (obvious point coming) creativity is one of the key advertising agency products that can quickly deliver fame. However, because thousands of agencies use creativity as their positioning and judging creativity is rather subjective; “we are creative” is a difficult concept to own. To solve this issue, many agencies use creative awards as “proof” and “objective” support for the positioning. I suggest that if an agency wants to own this positioning that it goes past the subjective beauty contest of what creative means to being more strategic and objective in discussing the benefits of being creative. Frankly, I haven’t seen many agencies head into this thought-leadership territory. I think that it has potential to ignite conversations. That said, a few agencies actually thrive on being creative and have found ways to “prove” it. In most cases it is because the agencies have the type of clients that 1) want it; 2) have the cash to produce and run with it and 3) are looking for something well out of the box. There aren’t many clients that fit this bill. Nike, Google and Samsung come to mind. Here are some of my favorite creative agencies. Clients: Coca-Cola, The Gap, Gerber Legendary Blades, LA Dodgers, Mello Yello, Sambazon and The Tampa Bay Buccaneers. What Works: In your face creative vibes. Like totally. Mutt is cool-Portland-based, run by an ex-Wieden ECD plus it has street-cred ala serious Nike work. What works: 72andSunny can use what ever “full-service” copy it wants — and, “72andSunny is about making brands matter in culture.” is a superior slogan. However, if you take a look at their website, they are leading full-bore with their work. They are helped by recognition from press like ADWEEK’s The 5 Best Ads of Super Bowl XLVII – Samsung ‘The Next Big Thing’ and being Ad Age’s Agency of the year. Nothing like third-party endorsement. Clients: Boost Mobile, Google, Intel, Lee, Penfolds, Sydney Opera House, U Bank. About: “The Monkeys create provocative ideas that live within advertising, entertainment and technology. We’ve been called an ad agency, a collective, a branded content company, the business model of the future and a bunch of bloody dreamers. What Works: As is usually the case with “creative” shops that actually live the dream, The Monkeys have… the right clients, the right awards (as proof), a provocative culture, trully “entertaining and innovative ideas” like The Big Drink and a brand name that begs a look. As client agency selection research shows, clients seek agencies that can deliver business-building strategic insights in addition to having raw creative talent. Agencies that help clients break through the complexity of today’s consumer, media and ever changing technology space will get the client ear. You will notice that I have an English bias. As smart as American, Australian, New Zealand and Argentinian agencies can be, England remains the birthplace of Account Planning and a refined strategic approach. Clients: Boots #7, FOX International, Ketel One, Mandarin Oriental Hotel Group, U.S. Tourism and Wedgwood. About: “LONDON is an international advertising agency built for today. What Works: What large, progressive client wouldn’t want “one brilliant idea that can work in any media, anywhere in the world?” London also does a masterful job of using their case studies to support their strategic positioning. To achieve this, they invented the clarifying idea of “Straight Line Thinking” to frame their strategic approach. Clients: Absolut, Coca-Cola, Heineken, Kraft, Lego, Mars Pet Care, Nokia and Sony PlayStation. About: “There are two types of brands in the world. Those that define themselves by what they make, and those that define themselves by a set of values, which allow them to stretch, and remain unpredictable as to what they’ll do next. We are the latter, and we stand for ‘Radical Objectivity’. A promise that can take us anywhere. We emphatically reject the conventions of the marketing landscape, in which each agency pushes the merits of the particular discipline they offer. We’re in the business of whatever is the right solution for our clients. Are we PR? Are we Advertising? Are we Media? Are we Digital? What Works: Naked introduced the concept of communication planning in 2006 as a separate service that lives between media and creative agencies. Naked is a channel-planning agency that can honestly claim to be media neutral. BBH is large and is historically positioned as being uber creative. However, I am including them here because they make it very clear that their creativity is based on a focus on strategy via BBH Labs. Clients: Axe, British Airways, Dove, Google, Johnnie Walker, Mentos and Vasline. What Works: BBH has decided to focus on being smart and tuned in. They promise the benefits from a dedication to R&D that delivers powerful work. This is a rare positioning that can and is owned. Some agencies simply have it. And, some clients want it. What works: Well, first of all you get Saatchi juice. Then you have to ask, what large, progressive client wouldn’t want Brutal Simplicity in today’s complex and over stimulated media environment? Top clients: Adidas, Aquafresh, Apple, Four Seasons Hotels, GSK, John Smiths and Nissan. What Works: Disruption works as both an emotional and service benefit. Disruption brings in an Internet start-up vibe into the occasionally “me-too” world of advertising. Clients: Ford, Microsoft, Oberto, Rainier beer, Seattle Sounders, Taco Del Mar, T-Mobile and Wilson Tennis. What Works: First of all, the name. Second, if there is in fact a box, these guys have never been near it. Third, the work. These combine to attract clients that are looking for Wexley’s brand of curated insanity. Oh, and their office. Experts and specialists have decided to own a niche. The advantage of this “expert” positioning is that a smaller agency can really concentrate on one key marketing area to take the limitations of geography out of the equation to attract national clients. The move from a “full-service” positioning can be a tough one for smaller agencies, as they have always felt the call to be everything to everyone. Experts come in all sizes and shapes. There are agencies that focus on a single demographic. Experiential agencies. Retail / shopper specialists. Direct marketers. Strategic branding agencies. Product category specialists. Video experts. Mobile expert. And, so on. Some clients want a one-stop-shop and some want expertise. What Works: Focus works. Saturday’s group of branded marketing services (Saturday, Wednesday, RMO, Tomorrow, Independent Talent Brands and the magazine Industry) deliver the expertise the fashion and luxury industry needs – or, as importantly, thinks it needs. About: “Mobile is the fastest growing medium the world has ever seen. With this growth comes huge disruption… and massive opportunity. What Works: eMarketer reports that mobile will account for more that $7.7 billion in marketing spend in 2013. Nuf said. Top clients: AT&T, Facebook, Google, Microsoft, National Geographic, NASA, Nike, Samsung and The Washington Post. About: “At JESS3 we take complex topics and large data sets and make them accessible through beautiful visuals. What works: JESS3 specialized in the growing segment of data visualization (think infographics) and got in very early. Early is good. Given the pace of change in the world of advertising, there are opportunities to own verticals like data visualization popping up every month. Wells, Ogilvy, Bernbach, Della Femina, Thompson, Saatchi, Riney, Chiat, Wieden, Burnett, Wunderman, Hegarty, McKinney, Richards, Mullen, Fallon. The people factor makes for distinctive personal branding where clients buy people and, of course their ideas. People give agencies personality and pitches can be won or lost on personal chemistry alone. We’ve all been there. The right name tied to big talent and often even bigger personality works to get the clients interested in the first place and positions the agency. We know that Crispin Porter + Bogusky got the call because clients wanted a piece of Alex. Ditto, Droga, Graf, Thaler, Matejczyk or Hofherr, Richards, Bowen, Goodby or Silverstein and Wong. While cool, modern names like Milk, meat and potatoes, Moosylvania, Moxie, Mother, The Monkeys and, yes, Mutt will continue to be birthed, agencies with founder names – backed by big talent – still provide a defining positioning. You have a brand positioning whether you like it or not. Why not manage it and use it to win new accounts? Unless you just won every creative award in Cannes, Tokyo or Milan, you might want to find something other to say than “We are creative.” Or, integrated, full-service, media agnostic, nimble, effective, agnostic or hybrid for that matter. Peruse my easy to use advertising agency directory to see the range of agency positions you could steal, um, tweak. Develop an agency expertise that you can own. Or, have it at least be a marketable agency ingredient that you could use to open doors. Become known as a super-smart, strategic thought-leader. Clients are looking for strategic guidance. Hire an award winning ECD. Get a famous name on the door. Hire a catalyst to help get your new positioning and new business quest moving really fast. Here is Part I & Part III. This entry was posted in Marketing, New Business, Smart Agencies and tagged ad agency, advertising, demographics, marketing, new business, social media. Bookmark the permalink. Trackbacks are closed, but you can post a comment.